Let me encourage you to eat some fruits and veggies today with an idea about what good health helps God put in them! This is a reference I use when I do employee health screening at the Genesis Care Center. Posted in Fun	| Comments Off on What cool things are in those cherries that you’re eating? We have had a couple of gray crowned cranes and some Egyptian geese visit the farm recently. It is great to be able to birdwatch from our backyard. I’m thankful that the farm’s dogs don’t chase these big guys away. 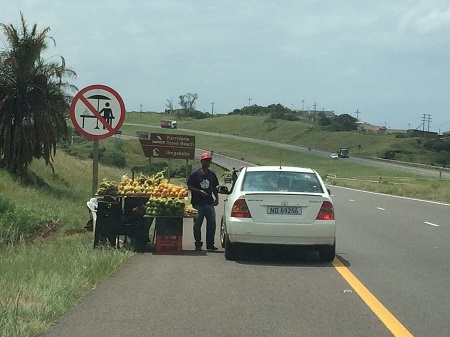 Finally, a clear photo of our local freeway fruit stands. Too bad I couldn’t get the speed limit sign in the photo also! 120 km/hour or 75 mph. It’s not exactly a safe place to sell mangoes.